“You got your science fiction in my fantasy,” said the gamer looking for a decent fantasy videogame to fund on Kickstarter. “And you got your fantasy in my science fiction,” said the gamer looking to fund an interesting science fiction videogame on Kickstarter. After a brief shoving match, the two gamers took each other to the ground, forcing me to step between them. There are dragons in this game, and you know what we do with dragons in video games? We fight them! I mean, that’s assuming we can’t talk them out of it and become allies like in some video games–dragon mythology can be crazy like that. But thanks to 3 Sprockets, you can fight all the dragons you want, so long as their project, Fight the Dragon, is funded. 3 Sprockets describes Fight the Dragon as a 3D mini action RPG that plays like a hack-n’-slash. Players will explore dungeons while hacking, slashing, rolling, and performing all the other hack-n’-slash staples. Players should take 10-15 minutes to explore a dungeon, but players could easily lose track of the time. Of course, players will also have loot to explore, and characters to customize. The game has an interesting style that reminds me of Diablo and Gauntlet, and the characters look like they come from the Miiverse. Fight the Dragon has a few additions that will ramp up the value for hack-n’-slash fans. 3 Sprockets is throwing in a level-editor, so players can feel free to come up with their own dragon-infested dungeons. 3 Sprockets is also throwing in both online and local drop-in multiplayer for up to four players, which reminds me of my days playing Gauntlet for PlayStation 2. It’s perfect for a Hack-n’-slash LAN party! Fight the Dragon is not the next ground-breaking game, but it is a game born from passionate fantasy and RPG enthusiasts. If you share the same sentiments, then you should check out Fight the Dragon’s Kickstarter. “Vroom! Vroom! Vroooooooooooom! Oh Sh—Hit the Brakes! ERRRRRRRRRRRRK! WHOO! That was a close one!” That’s what I imagine I’d say while playing Space Trucker. But I’m not the brightest person, so I keep confusing space truckers to earthling truckers—not to mention there’s apparently no sound in space. But if Space Shark Games Limited’s Space Truckers is funded, I may have a better idea of what it’s like to be a trucker…in space! Being serious for moment, Space Shark Games has created a great premise. Rather than being a trucker, players are actually entrepreneurs looking to cash in on some asteroid mines. A young billionaire in the year 2022–the players–made deals with the U.S., Russia, and other corporations to acquire space modules and build an orbital base. 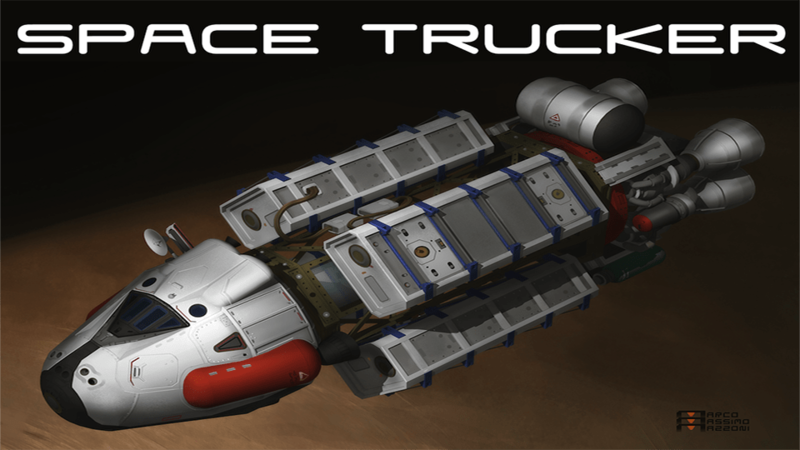 Now, Players will first need to build their first space truck and gather enough clients to expand their business. Players will manage their fleet from the space station, which serves as the HUB. As business booms, players will need to properly manage in research development, marketing, ship-building, training, and route-planning. Space Trucker, like last week’s New Orbit, takes pride in its ship customization. Players will have to customize the ship’s four modules: the hull, command, cargo, and propulsion. Players will have to build their ships accordingly, as some ships work better in certain situations than others. On top of that, Space Trucker is an art-heavy game, giving players a reason to take pride in their creations. Like how 3 Sprockets is passionate about fantasy, Space Shark Games Limited is passionate about space, and they’re showing it with Space Truckers. After all, a game about logistics sounds much more fun when the setting is in space.